Woodhead, J., Hergt, J., Giuliani, A., Phillips, D., Maas, R. (2017) Tracking continental-scale modification of the Earth’s mantle using zircon megacrysts. Geochem. Persp. Let. 4, 1–6. Research funded by the research group. Metasomatism, the chemical alteration of rocks by a variety of melts and fluids, has formed a key concept in studies of the Earth’s mantle for decades. Metasomatic effects are often inferred to be far-reaching and yet the evidence for their occurrence is usually based upon individual hand specimens or suites of rocks that display considerable heterogeneity. In rare cases, however, we are offered insights into larger-scale chemical modifications that occur in the mantle. Here we utilise the Lu–Hf systematics of zircon megacrysts erupted in kimberlite magmas to discern two temporally and compositionally discrete metasomatic events in the mantle beneath southern Africa, each having an influence extending over an area exceeding one million km2. These data provide unambiguous evidence for metasomatic processes operating at continental scales and seemingly unperturbed by the age and composition of the local lithospheric mantle. The most recent of these events may be associated with the major Jurassic-Karoo magmatism in southern Africa. Figure 1 Schematic map of southern Africa showing kimberlite localities for zircon megacrysts analysed in this and previous studies. The major tectonic domains are also included. Figure 2 Age and isotopic composition data for zircon megacrysts. (a) Zircon Hf-isotope data showing a natural compositional subdivision into two distinct groups, further illustrated by Kernel Density estimates. Note the remarkable isotopic homogeneity within each group despite large variations in geographic location and age. All data from this study unless marked: N = Nowell et al. (2004), G = Griffin et al. (2000). (b) Inset showing a statistically significant correlation between zircon 176Hf/177Hf composition and age. Only zircons for which precise U-Pb Concordia ages are available are used to construct this plot. Literature data with less precise age determinations (greyed out in 2a) are excluded. (c) An equivalent plot to 2b for 143Nd/144Nd isotope variations. (d) A comparison between kimberlite U-Pb perovskite ages, widely used to estimate the timing of magmatism, and U-Pb zircon megacryst ages from the same intrusion. Megacryst ages clearly approximate those of the kimberlite host, at least within the resolution of the perovskite technique. Figure 3 A three-step process, summarised in panel (a), proposed to explain the variations within the Nd- and Hf-isotope arrays for zircon megacrysts. (i) A source with prolonged depletion in Lu/Hf and Sm/Nd evolves to highly negative εNd and εHf compositions, depicted here as the source of various lamproites (from Davies et al., 2006 and references therein) (ii) A carbonate melt, with an isotopic composition similar to OIB pervades this source, preserving the Hf isotopic composition of the source owing to its low Hf content, but overprinting the source rocks with a Nd isotope composition more typical of OIB. In addition to displacing the isotopic composition of the source rocks off the mantle array, this metasomatic process stabilises high Lu/Hf phases. (iii) With time, the isotopic compositions of the source evolve along steep trajectories (shown by the dashed blue arrow in panel (b) owing to their now elevated Lu/Hf and Sm/Nd ratios. Parental melts to zircon megacrysts (red circles for Group A zircons, blue circles represent the possible locations of initial εHf-εNd for Group B zircons, calculated for a range of potential ages) tap this source periodically, as it evolves to higher εNd and εHf with time. Mantle array line from Vervoort et al. (1999). Table 1 Summary data. 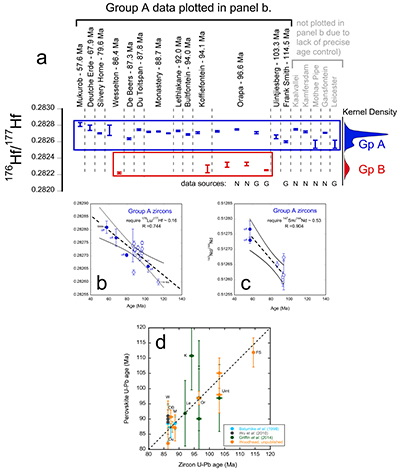 U-Pb age, Hf and Nd-isotope data for megacryst zircons. All data from this study unless otherwise noted: G = Griffin et al. (2000), N = Nowell et al. (2004). Where multiple solution analyses are shown from the same kimberlite body these represent different zircon megacrysts. Figure S-1 U-Pb Concordia plots for zircons analysed in this study. Kimberlite megacryst zircons for Group A possess ‘well behaved’ U-Pb systematics allowing the calculation of Concordia ages (upper panel). In contrast all of the Group B zircon megacrysts (lower panel) show evidence of disturbance in the U-Pb system. This implies they are older and have been variably reset during entrainment into the host kimberlite. Table S-1 U-Pb isotope and trace element data for zircon samples used in this study. See Materials and Methods for analytical details and Figure S-1 for corresponding Concordia plots. Table S-2 Hf-isotope data for megacryst zircons. All data from this study unless otherwise noted: Griffin et al. (2000) or Nowell et al. (2004). Given the relatively small datasets involved, a Tukey Biweight robust mean has been employed to determine the central tendency in the Hf-isotope ratios for each suite. Parent daughter ratios are unsuited to this approach due to their inherently more scattered nature, the result of magmatic zonation: here a simple arithmetic mean is employed. Table S-3 Calculated temperatures based on Ti-in-zircon using the formulation of Ferry and Watson (2007). See Materials and Methods and Figure S-2 for further information and our interpretation of these results. Figure S-2 Calculated temperature intervals for zircon megacrysts. Temperature values calculated at variable pressure using the Ti-in-zircon thermometer of Ferry and Watson (2007) and Ti concentrations of megacrysts in southern African archetypal kimberlites. Note that, if the Ti-in-zircon temperatures truly reflect the equilibration conditions of zircon megacrysts and assuming a typical cratonic mantle geotherm of 40–42 mW/m2, the zircon megacrysts could only be in equilibrium with the ambient mantle at P of 2.5–3.0 GPa. Valley, J.W., Kinny, P.D., Schuklze, D.J., Spicuzza, M.J. (1998) Zircon megacrysts from kimberlite: oxygen isotope variability among mantle melts. Contributions to Mineralogy and Petrology 133, 1–11. Belousova, E.A., Griffin, W.L., O’Reilly, S.Y., Fischer, N.I. (2002) Igneous zircon: trace element composition as an indicator of source rock type. Contributions to Mineralogy and Petrology 143, 602–622. Page, F.Z., Fu, B., Kita, N.T., Fournelle, J., Spicuzza, M.J., Schultz, D.J., Vijoen, F., Basei, M.A.S., Valley, J.W. (2007) Zircons from kimberlite: new insights from oxygen isotopes, trace elements, and Ti in zircon thermometry. Geochimica et Cosmochimica Acta 71, 3887–3903. Kinny, P.D., Compston, W., Bristow, J.W., Williams, I.S. (1989) Archean mantle xenocrysts in a Permian kimberlite: two generations of kimberlitic zircon in Jwaneng DK2, southern Botswana. Geological Society of Australia Special Publication 14, 833–842. Nowell, G.M., Pearson, D.G., Bell, D.R., Carlson, R.W., Smith, C.B., Kempton, P.D., Noble, S.R. (2004) Hf isotope systematics of kimberlites and their megacrysts: new constraints on their source regions. Journal of Petrology 45, 1583–1612. ). They record precise U-Pb ages and initial 176Hf/177Hf isotope ratios providing important constraints on the age and nature of the metasomatic events occurring in their mantle sources. 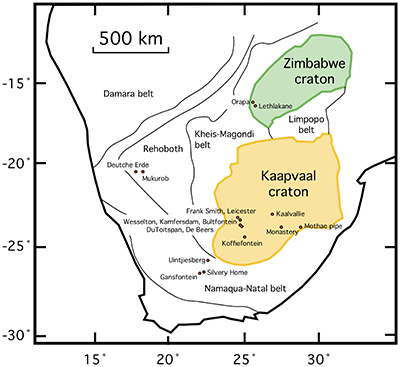 We present the first geographically-extensive survey of Hf-isotope and U-Pb age distributions for zircon megacrysts in southern African kimberlites, representing widely spaced intrusions spanning both cratonic (Kaapvaal, Zimbabwe) and non-cratonic settings (Fig. 1). We also report the first Nd-isotope data for zircon megacrysts. Pearson, D.G., Wittig, N. (2014) The formation and evolution of cratonic mantle lithosphere – evidence from mantle xenoliths. In: Holland, H., Turekian, K. (Eds.) Treatise on Geochemistry. Second Edition, Elsevier, Amsterdam, Oxford, Waltham, 255–292. Griffin, W.L., Pearson, N.J., Belousova, E., Jackson, S.E., van Achterburgh, E., O’Reilly, S.Y., Shee, S.R. (2000) The Hf isotope composition of cratonic mantle: LAM-MC-ICPMS analysis of zircon megacrysts in kimberlites. Geochimica et Cosmochimica Acta 64, 133–147. ), our analyses show near identical isotopic compositions in samples derived from numerous intrusions distributed across a region of >1 million km2. ). Remarkably, the subtle variations in 176Hf/177Hf and 143Nd/144Nd in zircons of the larger Group A correlate with age and may reflect radiogenic ingrowth in the source of the metasomatic zircon parent melts (Fig. 2b, 2c). Although the 176Hf/177Hf – age correlation is largely defined by the off-craton samples that show the greatest range of ages, it remains true that the cluster of on-craton samples also lies along this array. All results from this study plot below the Nd-Hf isotope mantle array (Fig. 3). Group A zircons yield precise and concordant U-Pb ages which generally approximate the (usually less precise) age estimates of their kimberlite hosts (Table 1, Figs. 2d and S-1). In contrast, U-Pb systematics for Group B zircons are disturbed (Fig. S-1), precluding accurate dating, and suggesting a more protracted history.
. (b) Inset showing a statistically significant correlation between zircon 176Hf/177Hf composition and age. Only zircons for which precise U-Pb Concordia ages are available are used to construct this plot. Literature data with less precise age determinations (greyed out in 2a) are excluded. (c) An equivalent plot to 2b for 143Nd/144Nd isotope variations. (d) A comparison between kimberlite U-Pb perovskite ages, widely used to estimate the timing of magmatism, and U-Pb zircon megacryst ages from the same intrusion. Megacryst ages clearly approximate those of the kimberlite host, at least within the resolution of the perovskite technique. Davies, G.R., Stolz, A.J., Mahotkin, I.L., Nowell, G.M., Pearson, D.G. (2006) Trace element and Sr-Pb-Nd-Hf isotope evidence for ancient, fluid-dominated enrichment of the source of Aldan Shield lamproites. Journal of Petrology 47, 1119–1146. Vervoort, J.D., Patchett, P.J., Blichert-Toft, J., Albarède, F. (1999) Relationships between Lu-Hf and Sm-Nd isotopic systems in the global sedimentary system. Earth and Planetary Science Letters, 168, 79–99.
. Where multiple solution analyses are shown from the same kimberlite body these represent different zircon megacrysts. Isotopic constraints. Our results provide a consistent picture of megacryst parental melts which tapped an isotopically homogeneous source extending over hundreds of kilometres, and encompassing a time interval of nearly 70 Myr, the range of U-Pb ages (114–56 Ma) recorded by the zircons. The apparent 176Hf/177Hf – age relationship defined by the Group A zircons places important constraints on the nature and evolution of their mantle source(s). To produce such a correlation these source rocks must have been relatively homogeneous initially and subsequently evolved rapidly with a strongly super-chondritic 176Lu/177Hf ratio (~0.16, Fig. 2b). The initial 143Nd/144Nd values for Group A zircon megacrysts also correlate with age (Fig. 2c), consistent with a source that evolved with a moderate-high 147Sm/144Nd ratio of ~0.53 (although both parent-daughter ratios are poorly defined, based on the paucity of the data). Importantly, prior to rapid radiogenic ingrowth, the initial source rock composition must have been located off the mantle-array, displaced to lower 176Hf/177Hf for a given 143Nd/144Nd (Fig. 3). This also provides important insights into both the nature of the original mantle source rocks and the metasomatic fluid that modified them. We postulate that the mantle source rocks originally had a protracted history of unusually low Lu/Hf and Sm/Nd and developed initial 176Hf/177Hf and 143Nd/144Nd that are low relative to MORB mantle (i.e. ‘enriched mantle’, Fig. 3). Subsequent metasomatism of these source rocks not only drastically raised Lu/Hf to drive rapid 176Hf ingrowth for at least ~70 Myr (Fig. 2b) but must also have had a) low Hf contents to preserve the original unradiogenic 176Hf/177Hf signature of the protolith but b) sufficient Nd to modify the 143Nd/144Nd to values more typical of OIB. Metasomatism therefore decoupled Hf from Nd (and presumably Sr) isotope compositions to generate source rocks, and ultimately zircon megacrysts, with compositions to the right of the Nd-Hf mantle array (Fig. 3). The lack of precise age control precludes a similar assessment for the much smaller Group B zircon dataset. Nevertheless, the fact that zircons sharing such similar isotopic characteristics were erupted across broad areas of southern Africa (i.e. Wesselton and Koffiefontein in the Kimberley area, South Africa, and Orapa in Botswana), supports the existence of a second widespread event in the mantle beneath the southern African sub-continent. Giuliani, A., Kamenetsky, V.S., Phillips, D., Kendrick, M.A., Wyatt, B.A., Goemann, K. (2012) Nature of alkali-carbonate fluids in the sub-continental lithospheric mantle. Geology 40, 967–970. Russell, J.K., Porritt, L.A., Lavallée, Y., Dingwell, D.B. (2012) Kimberlite ascent by assimilation-fuelled buoyancy. Nature 481, 352–356. Dobson, D.P., Jones, A.P., Rabe, R., Sekine, T., Kurita, K., Taniguchi, T., Kondo, T., Kato, T., Shimomura, O., Urakawa, S. (1996) In-situ measurement of viscosity and density of carbonate melts at high pressure. Earth and Planetary Science Letters 143, 207–215. Bizimis, M., Salters, V.J., Dawson, J.B. (2003) The brevity of carbonatite sources in the mantle: evidence from Hf isotopes. Contributions to Mineralogy and Petrology 145, 281–300. Nowell, G.M., Pearson, D.G., Kempton, P.D., Irving, A.J., Turner, S. (1998). A Hf isotope study of lamproites: Implications for their origins and relationships to kimberlites.In: Gurney, J.J., Gurney, J.L., Pascoe, M.D., Richardson, S.H. (Eds.) 7th International Kimberlite Conference, Extended Abstracts. Red Roof Design, Capetown, 637–639. ). At small degrees of metasomatic addition, the expected mixing trajectory is almost horizontal as the inferred carbonate melt has high Nd/Hf and eNd relative to the enriched mantle source (Fig. 3). The marked increase in Lu/Hf of this carbonate-metasomatised lithospheric mantle then drives a rapid rise in 176Hf/177Hf (producing very steep trends in Nd-Hf isotope space) with time. Garnet may have been among the newly-grown high-Lu phases important in establishing the high Lu/Hf ratio of the metasomatised source. As this source evolves and is sampled by kimberlite magmatism during the Jurassic and Cretaceous (producing zircon megacrysts), the isotope vs. age covariation is revealed (blue dotted arrow, Fig. 3). Tappe, S., Pearson, D.G., Kjarsgaard, B.A., Nowell, G., Dowall, D. (2013) Mantle transition zone input to kimberlite magmatism near a subduction zone: origin of anaomalous Nd-Hf isotope systematics at Lac de Gras. Earth and Planetary Science Letters 371–372, 235–251. Pearson, D.G., Brenker, F.E., Nestola, F., McNeill, J., Nasdala, L., Hutchinson, M.T., Matveev, S., Mather, K., Silvermit, G., Schmitz, S., Vekemans, B., Vincze, L (2014) Hydrous mantle transition zone indicated by ringwoodite included within diamond. Nature 507, 221–224. ). Our data do not preclude either possibility. Eglington, B.M. (2006) Evolution of the Namaqua-Natal Belt, southern Africa – a geochonological and isotope geochemical review. Journal of African Earth Science 46, 93–111. ), the youngest terrane with Cretaceous kimberlites; a younger limit is provided by the age of the oldest host kimberlite, the 114 Ma Frank Smith pipe. Importantly, the rapid isotopic evolution of the modified mantle source required by the zircon data, make it unlikely that the metasomatic event occurred more than a few hundred million years ago. Although the timing of Group B zircon formation is unknown (because their U–Pb systematics have been disturbed) some limits can be placed on their age (and hence the minimum age of metasomatism of their source), by calculating the initial εHf-εNd, for a range of hypothetical ages. Using the single Group B zircon for which we have Nd data (Koffiefontein), ages <250 Ma or >>500 Ma are highly improbable because the resultant zircon initial εHf-εNd would be unfeasible (Fig. 3). On this basis, we speculate an age for the Group B zircons of between 250 and 500 Ma, with metasomatic alteration of their mantle source being somewhat older. Konzett, J., Armstrong, R.A., Sweeney, R.J., Compston, W. (1998) The timing of MARID metasomatism in the Kaapvaal mantle: an ion microprobe study of zircons from MARID xenoliths. Earth and Planetary Science Letters 160, 133–145. Ernst, R.E., Bell, K. (2010) Large igneous provinces (LIPs) and carbonatites. Mineralogy and Petrology 98, 55–76. Giuliani, A., Kamenetsky, V.S., Phillips, D., Kendrick, M.A., Wyatt, B.A., Goemann, K. (2014) LIMA U-Pb ages link lithospheric mantle metasomatism to Karoo magmatism beneath the Kimberley region, South Africa. Earth and Planetary Science Letters 401, 132–147. ). A link between widespread Karoo magmatism, modification of the southern African continental mantle, initiation of kimberlite magmatism, and megacryst formation therefore appears an intriguing possibility worthy of further study. A more disturbed and less sampled suite of zircon megacrysts supports the occurrence of a similar but older event. We thank DeBeers for provision of the zircon samples that were originally collected by Dr John Bristow. JW and AG acknowledge funding from the Australian Research Council. Alan Greig is thanked for technical assistance. Batumike, J.M., Griffin, W.L., Belousova, E.A., Pearson, N.J., O'Reilly, S.Y., Shee, S.R. (2008) LAM-ICPMS U-Pb dating of kimberlitic perovskite: Eocene-Oligocene kimberlites from the Kundelungu Plateau, D.R. Congo. Earth and Planetary Science Letters 267, 609–619. Their trace element patterns (Valley et al., 1998, Belousova et al., 2002) and low δ18O (Page et al., 2007) indicate that they are not of crustal origin, but crystallised within the mantle and experienced only minimal chemical interaction with the host magmas that transported them to the surface. The work of Bizimis et al. (2003) also suggests that carbonate fractions of carbonatites have low Hf contents, high Lu/Hf and decoupled Nd-Hf isotope systematics. Carbonate melts are the least viscous of known terrestrial magma types (Dobson et al., 1996) and may thus have the ability to pervade large regions of the mantle. This suggests the source of Group A zircons postdates the ~1300 Ma amalgamation of the Kaapvaal craton and the Namaqua-Natal belt (Eglington, 2006), the youngest terrane with Cretaceous kimberlites; a younger limit is provided by the age of the oldest host kimberlite, the 114 Ma Frank Smith pipe. Importantly, the rapid isotopic evolution of the modified mantle source required by the zircon data, make it unlikely that the metasomatic event occurred more than a few hundred million years ago. The possibility of a link between such large-scale mantle metasomatism and formation of the Karoo large igneous province has previously been suggested (Konzett et al., 1998; Ernst and Bell, 2010), and would be consistent with the very large thermal and magmatic perturbation resulting from Karoo activity. The potential link between carbonate metasomatism and kimberlite/megacryst genesis has been made often but typically based upon petrographic or experimental evidence (e.g., Giuliani et al., 2012; Russell et al., 2012). New geochronological data for metasomatised mantle xenoliths from the Kimberley kimberlites also suggest a direct association of these events (Giuliani et al., 2014). Although a restricted isotopic range in Hf-isotopes has been noted previously in a much smaller dataset of kimberlite megacrysts from this area (Griffin et al., 2000), our analyses show near identical isotopic compositions in samples derived from numerous intrusions distributed across a region of >1 million km2. Some kimberlite pipes contain both zircon groups (e.g., Wesselton, Koffiefontein), as previously reported for the Orapa and Jwaneng kimberlites (Kinny et al., 1989, Griffin et al., 2000). Figure 2 [...] All data from this study unless marked: N = Nowell et al. (2004), G = Griffin et al. (2000). Table 1 [...] All data from this study unless marked: N = Nowell et al. (2004), G = Griffin et al. (2000). Griffin, W.L., Batumike, J.M., Greau, Y., Pearson, N.J., Shee, S.R., O’Reilly, S.Y. (2014) Emplacement ages and sources of kimberlites and related rocks in southern Africa: U-Pb ages and Sr-Nd of groundmass perovskite. Contributions to Mineralogy and Petrology 168, 1032. While details of their petrogenesis (and the origin of megacryst suites more broadly) remain a subject of active research, there is agreement that zircon megacrysts are produced by metasomatic melts in some way related to kimberlite magmas (e.g., Kinny et al., 1989; Nowell et al., 2004; Page et al., 2007). 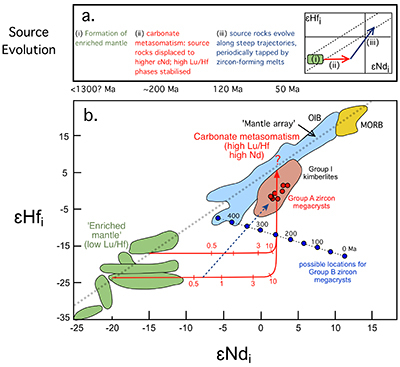 Accordingly, we explore a model in which a carbonate melt infiltrates mantle with compositions at the low εHf-εNd (enriched) end of the Hf-Nd mantle array, similar to the source of lamproite magmas which originate in enriched lithospheric mantle (Nowell et al., 1998, 2004). Our results reveal an entirely unexpected first order observation; that is, remarkable large-scale isotopic homogeneity among southern African zircon megacrysts (Fig. 2a) across lithospheric domains with widely differing ages (e.g., Pearson and Wittig, 2014). A location at or below the lithosphere-asthenosphere boundary is also plausible, consistent with evidence that at least some initial kimberlite melts originate from sub-lithospheric depths (Tappe et al., 2013; Pearson et al., 2014). Valley, J.W., Kinny, P.D., Schuklze, D.J., Spicuzza, M.J. (1998) Zircon megacrysts from kimberlite: oxygen isotope variability among mantle melts. Contrib. Mineral. Petrol. 133, 1–11. Figure 3 [...] Mantle array line from Vervoort et al. (1999). Wu, F.-Y., Yang, Y.-H., Mitchell, R.H., Li, Q.-L., Yang, J.-H., Zhang, Y.-B. (2010) In situ U-Pb age determination and Nd isotopic analysis of perovskites from kimberlites in southern Africa and Somerset Island, Canada. Lithos 115, 205–222. Megacryst zircons were mounted in resin blocks, sectioned and diamond-polished to remove any surface scratches. Mounts prepared in this way were then cleaned by ultrasonic agitation in dilute nitric acid before rinsing in ultrapure water and drying. U-Pb analyses were conducted using an ASI RESOlution 193nm excimer laser ablation system, coupled to an Agilent 7700 quadrupole ICPMS. Ablation was performed in helium and the ablated sample then rapidly entrained in argon before leaving the sample cell to improve aerosol transport efficiency. Laser spot sizes were varied between 90 and 120 mm to provide sufficient count rates to enable measurement of all relevant isotopes for the construction of U-Pb Wetherill Concordia plots (Table S-1). The laser was operated with a repetition rate of 5 Hz and energy density ~3 J cm-2. Data deconvolution were undertaken in the Iolite (Paton et al., 2011) environment using the method of correcting for downhole elemental fractionation described in detail in Paton et al. (2010). Most samples produced concordant analyses (Fig. S-1) and thus common Pb corrections were deemed unnecessary. Concordia ages were calculated using the IsoplotEx software (Ludwig, 2012). Analyses were conducted over a number of analytical sessions. During this time analyses of multiple zircon reference materials (Temora, Plesovice, 91500) provided ages accurate to within 2 % of accepted values (417 Ma, 337 Ma, 1065 Ma respectively). Figure S-1 U-Pb Concordia plots for zircons analysed in this study. Kimberlite megacryst zircons for Group A possess ‘well behaved’ U–Pb systematics allowing the calculation of Concordia ages (upper panel). In contrast all of the Group B zircon megacrysts (lower panel) show evidence of disturbance in the U–Pb system. This implies they are older and have been variably reset during entrainment into the host kimberlite. The same resin blocks and laser system described above were employed for Hf-isotope analyses except that, in this case, the laser was connected to a Nu Plasma MC-ICPMS. Laser spot sizes were varied between 70 and 90 mm in diameter and the laser was operated with a repetition rate of 5 Hz and energy density ~3 J cm-2. Each analysis represents a different zircon grain and incorporated a 30 second baseline measurement followed by 60 seconds on peak. Mass bias and interference corrections were performed as described in detail in Woodhead et al. (2004). The weighted means of analyses for individual zircons were calculated using the IsoplotEx software (Table S-2). Analyses were conducted over a number of analytical sessions. During this time analyses of multiple reference materials (Temora, Plesovice, BR266, QGNG, Mud Tank, Monastery) provided 176Hf/177Hf values within uncertainty of solution ICPMS values (Woodhead and Hergt, 2005). The single greatest impediment to Nd-isotope analysis of megacryst zircons is the initial dissolution of large quantities of material with low U content (zircons with low lattice radiation damage are notoriously hard to dissolve). For each sample, around 100 mg of crushed and powdered zircon was subjected to leaching in hot 2 M HCl to remove any contaminant phases and then washed, dried and weighed into high-pressure Teflon digestion vessels. The zircons were dissolved gradually over a period of several weeks with combinations of HF, HCl and HNO3 acids at 220 ˚C. After periods of several days at this temperature, liquid (with some undissolved sample) was removed from each vessel, collected, and replaced with fresh acid. This procedure eventually produced complete dissolution of the entire powder and, for each sample, the various dissolution steps could be combined and processed further. At this stage a small aliquot was taken for trace element analysis employing our Agilent 7700 quadrupole ICPMS, following techniques outlined in Eggins et al. (1997). This allowed determination of optimum spiking of the main solution with a 149Sm-150Nd mixed tracer. After a period of equilibration in a sealed Teflon vessel on the hotplate the sample plus tracer solution was dried down and Sm-Nd separated using conventional ion exchange procedures. Both elements were run on a Nu Plasma MC-ICPMS operating in static multi-collection mode with sample introduction using an Aridus desolvating unit and Glass Expansion OpalMist nebuliser operating at ~50 ml min-1 uptake. This produced Nd signals of 5–10 V for each sample. 143Nd/144Nd ratios were normalised to La Jolla = 0.511860, using reference material analyses interspersed with the samples. Typical internal (2 se) precisions of ≤±0.000012 and external (2sd) reproducibility of ±0.000020 were achieved. External reproducibility on the 147Sm/144Nd ratio was ±0.2 %. The 147Sm decay constant used in calculation of initial values was 6.54 10-12. Blank correction calculations produced shifts well within analytical uncertainty. Ti-in-zircon temperatures for the compositions of zircon megacrysts were calculated using the formulations of Ferry and Watson (2007), as in Table S-3. These formulations also require input of values for SiO2 and TiO2 activity and pressure. Our zircon megacrysts contain variable, but generally low concentrations of Ti (4 to 24 ppm with a single outlier showing 63 ppm; Table S-3). SiO2 activity was assumed to be buffered by olivine (Mg# = 84–88) – orthopyroxene (Mg# = 85–89) equilibrium in the ambient mantle (T = 1200–1400 °C; P ~ 5 GPa) surrounding the megacrysts before kimberlite entrainment, by using the formulation of O’Neill and Wall (1987). Compositions of olivine and orthopyroxene megacrysts and equilibration conditions of silicate megacrysts are based upon analyses from the Monastery (Gurney et al., 1979) and Jagersfontein (Hops et al., 1992) kimberlite. Modification of P, T, Mg#olivine and Mg#orthopyroxene input values in the calculation of SiO2 activity change the final calculated temperatures by <50 °C. The TiO2 activity was assumed buffered by crystallisation of ilmenite (i.e. aTiO2 ~ 0.9 ~ XTi in the tetrahedral site of ilmenite), which has previously been shown to co-precipitate with zircon in the kimberlite megacrysts suite (Moore et al., 1992). However, the dependence of calculated temperatures on TiO2 activity is minimal (<20 °C). Pressure significantly affects the calculated Ti-in-zircon temperatures (~50 °C/GPa). Thermobarometry measurements of megacrysts in southern African and Canadian kimberlites have previously shown that silicate megacrysts (i.e. garnet, clinopyroxene, orthopyroxene and olivine) crystallised at pressures above 4.0–4.5 GPa – (Gurney et al., 1979, Hops et al., 1992) and, perhaps, up to 7.0 GPa (Kopylova et al., 2009). When P values of 4.0 GPa or higher are applied to calculate Ti-in-zircon temperatures for the southern African megacrysts, however, the resulting temperatures are much lower than the ambient temperatures at those depths given by typical cratonic geotherms of 40–42 mW/m2 (Fig. S-2). The difference is exacerbated if a hotter, non-cratonic continental geotherm is selected, which might be more representative for off-craton kimberlite megacrysts. The zircon megacrysts would reflect ambient cratonic mantle conditions only if they equilibrated at P of ~2.5–3.0 GPa, corresponding to calculated temperatures of ~650–750 °C. This range is very similar to the T interval calculated by Page et al. (2007) for zircon megacrysts from the Kaapvaal craton. These results can be interpreted in two different ways. It is possible that the Ti-in-zircon temperatures reflect ‘true’ crystallisation (and equilibration) conditions for zircon megacrysts. However, this contrasts with the much higher equilibration temperatures recorded by other megacrysts from South-African kimberlite pipes (e.g., Monastery – Gurney et al., 1979, Jagersfontein – Hops et al., 1992), coupled with the interpretation that kimberlite megacrysts crystallise from magma batches that evolve and crystallise in situ (Moore et al., 1992, Page et al., 2007), i.e. without migrating over long distances. Alternatively, we note that Fu et al. (2008) compiled the Ti composition of ~500 terrestrial zircons from igneous and mantle rocks worldwide and demonstrated that the Ti-in-zircon thermometer largely underestimates the temperature of mafic igneous and mantle rocks provided by other independent geothermometers. Therefore, we prefer to conclude that the Ti-in-zircon megacrysts temperatures are not accurate in this particular setting and should be not considered in any petrogenetic model of zircon megacrysts in kimberlites. Eggins, S.M., Woodhead, J.D., Kinsley, L.P.J., Mortimer, G.E., Sylvester, P., McCulloch, M.T., Hergt, J.M., Handler, M.R. (1997) A simple method for the precise determination of >=40 trace elements in geological materials by ICPMS using enriched isotope internal standardisation. Chemical Geology 134, 311–326. Ferry, J., Watson, E. (2007) New thermodynamic models and revised calibrations for the Ti-in-zircon and Zr-in-rutile thermometers. Contributions to Mineralogy and Petrology 154, 429–437. Fu, B, Page, F.Z., Cavosie, A.J., Fournelle, J., Kita, N.T., Lackey, J.S., Wilde, S.A., Valley, J.W. (2008) Ti-in-zircon thermometry: applications and limitations. Contributions to Mineralogy and Petrology 156, 197–215. Gurney, J.J., Jakob, W. R. O., Dawson, J.B. (1979) Megacrysts from the Monastery kimberlite pipe. In: Boyd, F.R., Meyer, H.O.A (Eds.) The mantle sample. 2nd International Kimberlite Conference. American Geophysical Union. Hops, J.J., Gurney, J.J., Harte, B. (1992) The Jagersfontein Cr-poor megacryst suite: towards a model for megacryst petrogenesis. Journal of Volcanology and Geothermal Research 50, 143–160. Kopylova, M.G., Nowell, G.M., Pearson, D.G., Markovic, G (2009) Crystallization of megacrysts from protokimberlitic fluids: Geochemical evidence from high-Cr megacrysts in the Jericho kimberlite. Lithos 112S, 284–295. Ludwig, K.R. (2012) User’s Manual for Isoplot 3.75. A geochronological toolkit for Microsoft Excel. Berkeley Geochronology Centre, Special Publication No. 5. Moore, R.O., Griffin, W.L., Gurney, J.J., Ryan, C.G., Cousens, D.R., Sie, S.H., Suter, G.F. (1992) Trace element geochemistry of ilmenite megacrysts from the Monastery kimberlite, South Africa. Lithos 29, 1–18. Moore, A., Blenkinsop, T., Cotterill, F. (2008) Controls on post-Gondwana alkaline volcanism in Southern Africa. Earth and Planetary Science Letters 268, 151–164. O'Neill, H.S.C., Wall, V.J. (1987) The Olivine-Orthopyroxene-Spinel Oxygen Geobarometer, the Nickel Precipitation Curve, and the Oxygen Fugacity of the Earth's Upper Mantle. Journal of Petrology 28, 1169–1191. 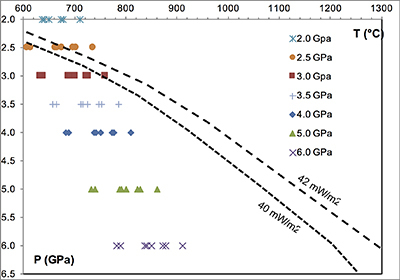 Paton, C., Woodhead, J.D., Hellstrom, J.C., Hergt, J.M., Greig, A., Maas, R (2010) Improved laser ablation U-Pb zircon geochronology through robust downhole fractionation correction. Geochemistry, Geophysics, Geosystems Q0AA06. Paton, C., Hellstrom, J., Paul, B., Woodhead, J., Hergt, J. (2011) Iolite: Freeware for the visualisation and processing of mass spectrometric data. Journal of Analytical Atomic Spectrometry 26, 2508–2518. Woodhead, J., Hergt, J., Shelley, M., Eggins, S., Kemp, R. (2004) Zircon Hf-isotope analysis with an excimer laser, depth profiling, ablation of complex geometries, and concomitant age estimation. Chemical Geology 209, 121–135. Woodhead, J.D., Hergt, J.M. (2005) A Preliminary appraisal of seven natural zircon reference materials for in situ Hf isotope determination. Geostandards and Geoanalytical Research 29, 183–195.